Sparke, Matthew 2017. Austerity and the embodiment of neoliberalism as ill-health: Towards a theory of biological sub-citizenship. Social Science & Medicine, Vol. 187, Issue. , p. 287. Ambagtsheer, F. de Jong, J. Bramer, W. M. and Weimar, W. 2016. On Patients Who Purchase Organ Transplants Abroad. American Journal of Transplantation, Vol. 16, Issue. 10, p. 2800. Zwart, Hub 2016. Transplantation medicine, organ-theft cinema and bodily integrity. Subjectivity, Vol. 9, Issue. 2, p. 151. Ambagtsheer, F. Van Balen, L. J. Duijst-Heesters, W. L. J. M. Massey, E. K. and Weimar, W. 2015. Reporting Organ Trafficking Networks: A Survey-Based Plea to Breach the Secrecy Oath. American Journal of Transplantation, Vol. 15, Issue. 7, p. 1759. 1. Farmer, P, Gastineau-Campos, N.New malaise: Bioethics and human rights in the global era. Journal of Law, Medicine and Ethics 2004;32:243–51; Scheper-Hughes, N.Organs without borders. Foreign Policy 2005;146:26–7. 2. Francis, LP, Francis, JG.Stateless crimes, legitimacy, and international criminal law: The case of organ trafficking. Criminal Law and Philosophy 2010;4(3):283–95; Harrison, T.Globalization and the trade in human body parts. Canadian Review of Social Anthropology I 1999;36(1):21–35. 3. Cohen, L.Where it hurts: Indian material for an ethics of organ transplantation. Zygon 2003;38(3):663–88; Shimazono, Y.The state of the international organ trade: A provisional picture based on integration of available information. Bulletin of the World Health Organization 2007;85(12):955–62. 4. Berlinguer, G.Bioethics, health and inequality. The Lancet 2004;364:1086–91; Budliani-Saberi, DA, Karim, KA.The social determinants of organ trafficking: A reflection of social inequity. Social Medicine 2009;4(1):48–51; Budliani-Saberi, DA, Delmonico, FL.Organ trafficking and transplant tourism: A commentary on the global realities. 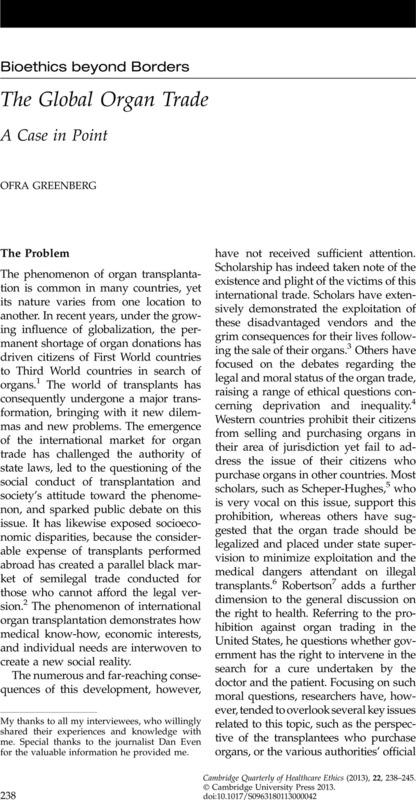 American Journal of Transplantation 2008;8:925–9; Strassberg, BA.Organ transplantation—A challenge for global ethics. Zygon 2003;38(3):643–62. 5. Scheper-Hughes, N.Keeping an eye on the global traffic in human organs. The Lancet 2003;361:1645–8. 6. De Castro, LD.Commodification and exploitation: An argument in favor of compensated organ donation. Journal of Law, Medicine and Ethics 2003;29(3):142–6; Friedlaender, M.The right to sell or buy a kidney: Are we failing our patients? The Lancet 2002;359:971–3; Khalili, M.Organ trading in Jordan: Bad news, good news. Politics and the Life Sciences 2007;26(1):12–14. 7. Robertson, JA.Controversial medical treatment and the right to health care. Hastings Center Report 2006;36(6):15–20. 8. The Declaration of Istanbul on Organ Trafficking and Transplant Tourism; available at http://multivu.prnewswire.com/mnr/transplantationsociety/33914/docs/33914-Declaration_of_Istanbul-Lancet.pdf (last accessed 10 Oct 2010). 9. Burawoy, M.Manufacturing the global. Ethnography 2001;2(2):147–59. 10. The full text of the transplant law is available at http://www.justice.gov.il/NR/rdonlyres/F8E6E7B8-D67A-475A-B64A-F9B86797F282/9952/2144.pdf (Hebrew, last accessed 15 Aug 2011). 11. http://www.transplant-observatory.org/Data%20Reports/Basic%20slides%202010.pdf (last accessed 1 Feb 2012). 12. Apart from the cost of transplants, these data appeared in an article by Dan Even in Ha’aretz, 9 Apr 2010 (Hebrew), in which he reported on data obtained from the National Transplant Center and the health insurance organizations. 13. National Transplant Center. Press Release: Summary of Activity in 2010 and Programs for 2011; 11 Jan 2011 Hebrew; available at http://www.briut.gov.il/transplant/news 2 (last accessed 20 Nov 2011). 14. Muraleedharan, VR, Jan, S, Prasad, SR.The trade in human organs in Tamil Nadu: The anatomy of regulatory failure. Health Economics, Policy and Law 2006;1:41–57. 15. Dan Even cites a senior functionary in the National Transplant Center. I received the same statistic from an additional well-informed source. See also Even D. The affair of the Swedish paper—Israel doesn’t use the organs of non-Israelis for transplants. Ha’aretz 28 Aug 2009 (Hebrew). 16. See note 6, Friedlaender 2002. 17. See note 2, Francis and Francis 2010. 18. Shivvers E. The international trade in human organs: Combating the demand for life; available at www.anselm.edu/NR/rdonlyres/4D9D0E9D-1C5E/Shivvers.pdf (last accessed 15 Apr 2009). 19. Yelinek, S.Payment for Organ Donations: The Future Market of Organ Trade. Tel-Aviv: Perlstein-Genosar; 2004 (Hebrew). My thanks to all my interviewees, who willingly shared their experiences and knowledge with me. Special thanks to the journalist Dan Even for the valuable information he provided me.